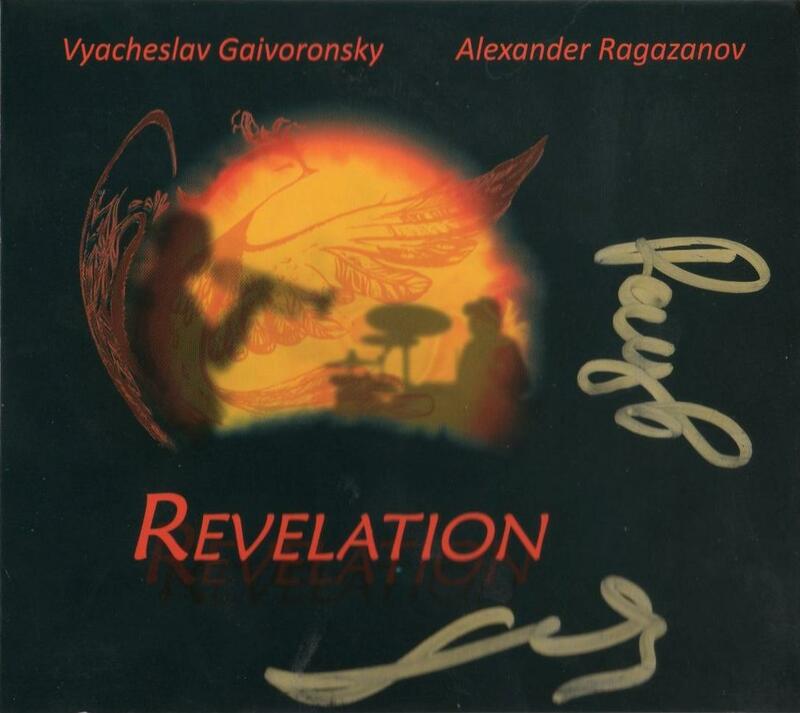 In one of my previous reviews on Russian master trumpeter Vyacheslav Gaivoronsky I made the unpleasant comment that he often combines serious music with silly moments, an unlikely combination that is luckily totally absent on this album. "Revelation" brings nine duets with drummer Alexander Ragazanov, and it is a revelation. Regular readers will know - and hopefully appreciate - my preference for trumpet-percussion duos, because they reflect the pure essence of music : free lyricism and rhythm, close to nature, close to our own feelings, close to our own physical existence, and then especially so if there are no patterns, no structures, just free playing. But I may be wrong about structure in this case : the whole album seems to evolve from pristine lightheartedness at the beginning, with flute even on the first track, playful melancholy on the second, but gradually becoming deeper, darker too, more earnest. If Ragazanov plays his trap in the conventional acoustic fashion - but how! - the trumpeter does not shy away from sound alterations. With "Unexpected Companion", he shows his darkest sounds, vibrating wildly, but surfacing again with clear sound. "Step Aside" is a short rhythmic delight, a ray of sunshine beaming through the dark clouds which follow with "On The Brink Abyss", on which the trumpet sounds like you've never heard it before, deep, raw, full of agony and distress, played over tribal percussive polyrhythmics. On the title track, the mad rhythms, hypnotic and mesmerizing, the uncanny vocals and soaring trumpet create a kind of primitive chant to placcate the gods to spare us all from some looming evil. And truth be told, it sounds unique, absolutely unique, and it is guaranteed to change the minds of even the most strongheaded gods. The long last track brings the pièce-de-resistance of the album, adding musical drama and tension, shifting colors and textures with just the two of them, first slowly, then gradually increasing the tempo, relaxing for more slow drama, then up again and ending in clear unison. Without a doubt, both musicians deserve much wider recognition. Among Gaivoronsky's best albums. I like your comment about trumpet/percussion duos. I actually hesitated in buying the Smith-Blackwell album, because I couldn't quite imagine it. It has fast become one of my favorites. I'll have to go for this one too.